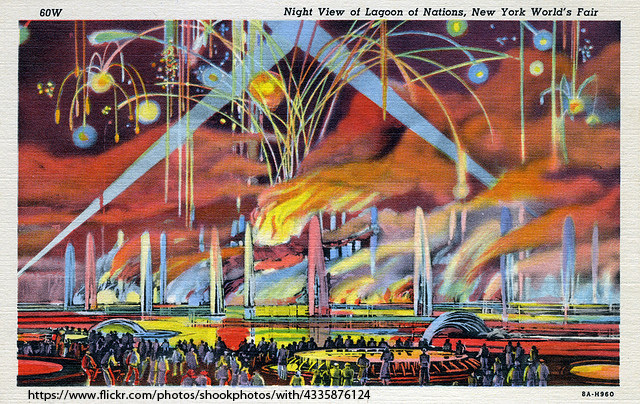 The Lagoon of Nations at the 1939 New York World’s Fair is one of those items I love running across while researching topics. Especially topics that lead you in different directions. It’s easy to argue that every single World’s Fair or Exposition held in the United States influenced EPCOT Center in some fashion. 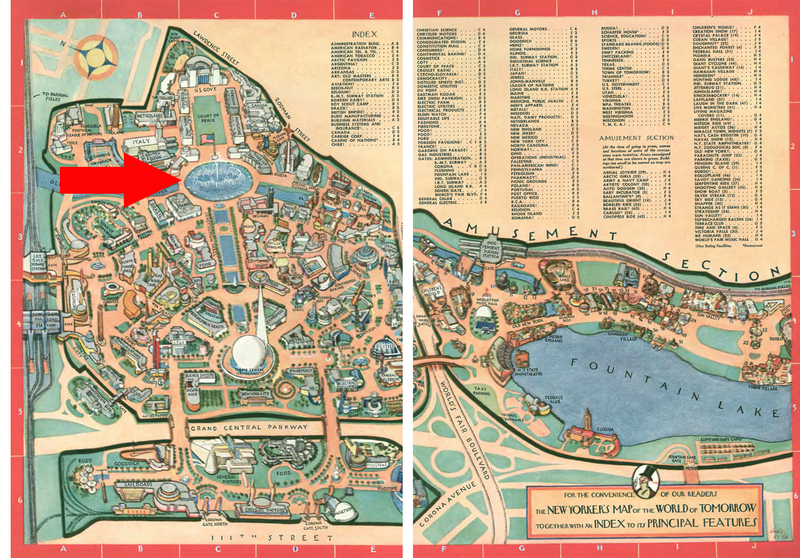 The Fairs in New York (1939/1940 and 1964/1965) and the 1962 Seattle Fair offered ideas that WED and the Imagineers used to develop EPCOT Center. I spoke with animation historian, Michael Barrier (his Walt biography is one of the best), about the possibility of Walt visiting the 1939/1940 New York World’s Fair. His response was that Walt had visited the New York area on April 9, 1940, but it was before the Fair opened. He did stop at Greenfield Village before returning to Los Angeles and was heavily into thoughts on what would become Disneyland. It’s also to be noted that Ben Sharpsteen (Disney director and producer) remembers seeing an early version of Cinerama (called Vitarama, at the time) at the Fair. So, there’s always the question of how much the fairs influenced Disney. I finished the eye-opening book, 1939: The Lost World of the Fair by David Gelernter. It reminded me a lot of Vinyl Leaves because you’re presented with several walk-throughs of various pavilions and the grounds of the 1939 New York World’s Fair. Most of the information presented comes from the diary of a young woman who visited the fair with her fiancee. She recorded a lot of the sights, sounds and smells of the fair and Gelernter provides a lot of insight and behind-the-scenes info. One of the more interesting sections discusses the evening show at the Lagoon of Nations which was located between Constitution Mall and the Court of Peace. The Lagoon of Nations was ringed by buildings from France, Belgium, Italy and had views of the US Government building and the Trylon and the Perisphere. 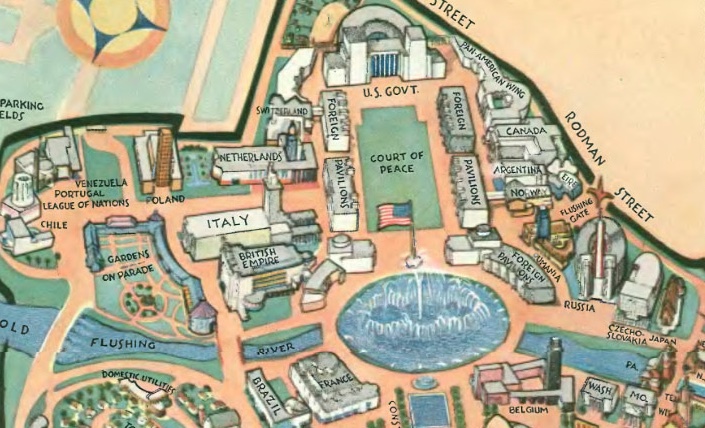 The main controls for the Lagoon of Nations shows were in the U.S. Govt. building at the top of the image. A rare photograph of the Lagoon of Nations finale from Bill Cotter. The Lagoon of Nations: A Spectacle of Fire and Light sounds pretty darn impressive. Most of the Expositions and World’s Fairs had a nighttime show on their lagoon or lake and they grew more impressive over the years. The technical process presented in the book is as jaw-dropping as the show must have been for the time. The Lagoon show drew on a thousand water nozzles, capable of throwing twenty tons of water into the air at a time. There were 400 gas jets, 350 fireworks guns, 3 million watts of light. A band performed in a studio at a distance, and the music was broadcast—in stereo, no less!—from great speakers that poked up above the Lagoon’s surface. Three technicians masterminded each night’s performance from inside the United States building. They sat at a console something like an organ’s, facing a mass of switches and buttons that controlled the nozzles and gas jets. The “score” unscrolled before them under glass, like the roll of a player piano. It instructed them symbolically which switches to throw and buttons to push. An electrical engineer named Bassett Jones had been lured out of retirement to design the show. He went in search of John Craig, who had staged a memorable fireworks display at Queen Victoria’s jubilee. Craig was traced to a Long Island potato field, where he was allegedly in the habit of fertilizing his crops with gunpowder. 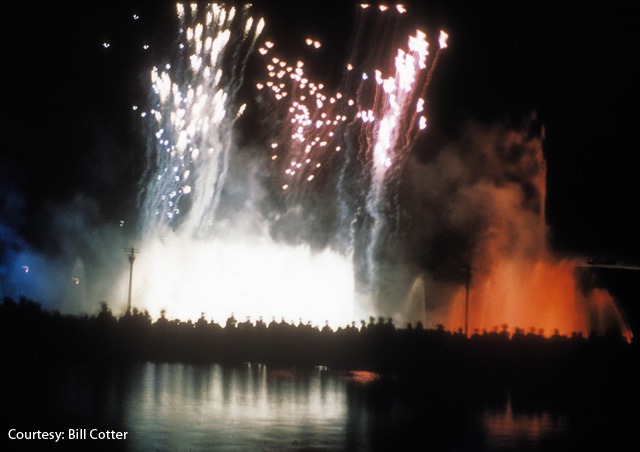 He developed noiseless fireworks for the Lagoon extravaganza. Joseph Jarrus was an expert gas engineer; at an abandoned gas plant in Brooklyn, ]arrus and Jones developed gas nozzles and colored flame displays. The nightly cost for the show was $1,000.00 which would amount to slightly over $17,000.00 today. There were four themes presented: The Spirit of George Washington; Fire Dance; Isle of Dreams; and Creation. The following video (http://www.youtube.com/watch?v=2quTbcMjD-I) has some fantastic color footage of the Fair, including a long segment on the Lagoon of Nations show. It should start at the 4:47 mark. Although there is no direct evidence of Walt or his staff visiting the Fair, it seems highly improbable that no one in the organization would have visited it. Regardless, the 1939 New York Word’s Fair was a touchstone, culturally, and was covered heavily in the nationwide media at the time. Also, with the theme Building the World of Tomorrow, you know that Walt Disney would have been interested in the Fair. 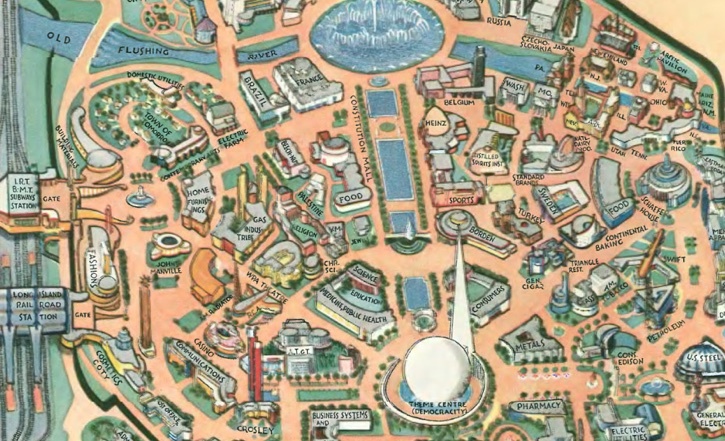 How influential do you think the 1939 World’s Fair was for EPCOT Center? Can you imagine how amazing the Lagoon of Nations shows were in 1939? I am the director of communications at Stuart Country Day School of the Sacred Heart in Princeton, NJ, which was designed and built by Jean Labatut in the early 1960’s. Though Professor Labatut mentored many modern architects (including Charles Moore and Robert Venturi), Stuart is the only building he designed that was built.